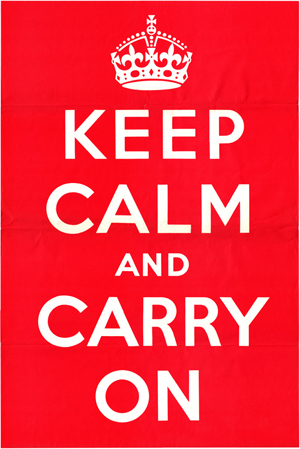 In recent years the phrase ‘Keep Calm and Carry On’ has become a meme, most often used in a poster that imitates (or satirizes) a 1939 British Ministry of Information poster. The interesting thing is that very few, in 1939 or throughout the war, knew of this poster or this phrase. Though almost two and half million of the posters were printed at the outbreak of the war, none were ever displayed publicaly, and all but a very few were pulped in 1940 as part of the paper salvage campaign. For more information, try the Wikipedia article article.